One of my favorite things about this place are the comments that follow in the wake of a newly posted review or a vaguely constructed ramble, especially when they form an appendix of additional information – as was the case with my post critiquing David Alexander's Murder Points a Finger (1953). Xavier confessed that it was favorite of him and "one whose lack of reputation" always surprised him as well as noting that "its author was not usually associated with the traditional mystery genre," while Richard Moore revealed David Alexander as "one of the leading journalists covering thoroughbred racing as a racing editor for the New York Herald Tribune and columnist for important racing publications" – and his tenure as the managing editor for the New York Morning Telegraph was "clearly the basis" for the Bart Hardin stories. All this did was whet my appetite for a Bart Hardin mystery and this time I had the foresight to order a copy of another book before having made my full acquaintance with its author, which is why I am now writing a review of The Death of Humpty Dumpty (1957) instead of impatiently marching back and forth in front of the letter box. Bart Hardin is the hard drinking, two-fisted editor of a sporting and showbiz rag named The Broadway Times and has a penchant for flowered vests and lives above a flea circus in a Times Square tenement, which is perhaps a combination that gives off some sort of pheromone that attracts trouble to his doorstep. 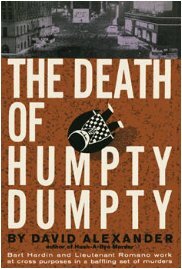 The Death of Humpty Dumpty opens with a stone-cold sober Bart Hardin starring glazy-eyed at his television screen, broadcasting the New Years celebrations, but as a professional in such indoor sports as Irish drinking he considers New Year's Eve as Amateur Night and refuses to touch a single drop of liquor. The plans for the night is to retire early, but then he receives an invitation from a friend and part-time lover, Zita Janos – a Hungarian nightclub dancer who twisted her ankle and now has the night off. Zita Janos invites him to come watch the famous New Year's Eve Ball descend from her apartment, but as all but one pair of eyes fixed themselves on the ball there's one pair, Bart Hardin's, distracted by a disturbing and surrealistic scene: Humpty Dumpty Hughes, a nightclub comedian, falls from a ninth-floor window of a hotel across the street and vanishes in mid-air! At least, he assumes that's what must have happened. The nightclub comedian could not have left a mess on the sidewalk (the people celebrating the new year beneath the window would definitely have responded to a falling man) and the police he called to investigate found no traces of a body on a balcony that was also located beneath the window. The following morning, Bart Hardin finds a cab driver with the pallid countenance of a skeleton and his ancient hansom cab on his doorstep. Someone stuffed a c-note in the cabby's hand to deliver a drunk friend to Hardin, but the drunkard in the back turns out to be Humpty Dumpty Hughes – fully dressed (except for his shoes) and a bullet wound in his chest inflicted after death. 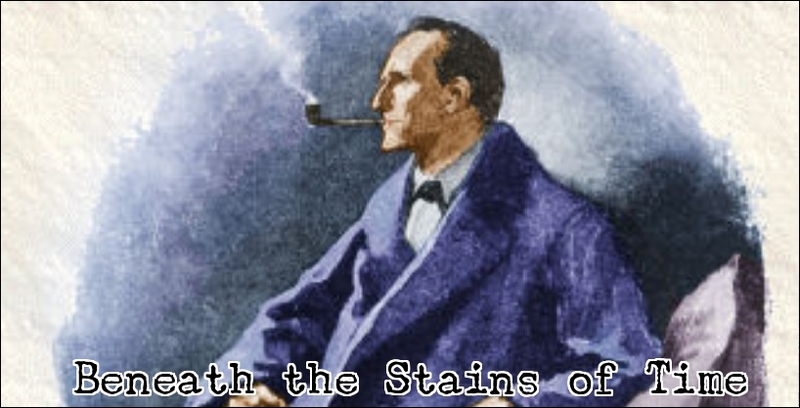 These opening chapters are evocatively written, wonderfully phantasmagorical in tone and simply dripping with imagination, but Alexander inexplicably began ditching these fantastic elements, one after another, before he took a turn into those mean streets – turning a detective story full of promise into an unexceptional hardboiled yawn yarn. You can discern this plunge into mediocrity yourself when you have reached the page on which Hardin learns of Zita Janos' kidnapping and has to confront one of the most dangerous loan sharks in town, Moe Selig, who's complacent enough when he's fed but has no problem chewing your head off when he has to wait or finds you a bit annoying. Hardin tries to both appease and vex the money-lending mob-boss, but everything he does simply cried incompetence, from setting up a false alibi for a bunch of murderers to verbally abusing an unwilling accomplish in such a way that the poor guy blows his brains out, but the worst thing of all is that the explanation to those imaginative events in the opening chapters shares the same lack of inspiration with the second half of the book. It was really, really disappointing to learn that there was nothing clever lurking behind its Alice-in-Wonderland façade. And that leaves me in two minds: I loved the front décor of this story, but the illusion was ruined when David Alexander showed the plain woodwork behind it and this left me dissatisfied after turning over the final page. Well, I guess this one of those books you can only fully appreciate if you’re devoted fan of the series. Hopefully, the next obscure mystery that has reached the top of the snow-capped peaks of Mt. To-Be-Read is a bit better as this is the second review in row that ended on a disappointed note. First, it's Bart Hardin. Not Harding. I read this a couple of days after your review of MURDER POINTS A FINGER (a copy of which I now own through sheer luck!) I didn't really like it so I passed on reviewing it. I thought: "When TomCat gets a hold of this, he will be VERY disappointed with the impossible crime part which is only an illusion." I was right. The horse racing newspaper background is slightly interesting, the gangster stuff seemed very old hat to me. I liked the stripper character but when she got killed in the hit-and-run accident I lost interest in the book. I plodded on though. That embarrassing mistake has been duly corrected. I must have automatically added a "G" to his name when I was writing this review. No idea why. Anyway, I was definitely expecting more from the impossible situation, because the previous book was such a fine example of the dying message that it raised expectations and hoped that he would do the same with the impossible crime story, but that was, alas, not the case. Oh, well. I was all set to buy a copy of MR DIABOLO until I saw how scarce AND pricey it is. Oh well. Added to the hunt list. Thanks, Jim. You could also add Michael Gilbert's The Danger Within, John Dickson Carr's Captain Cut-Throat and Hilary St. George Saunders' The Sleeping Bacchus to the list of notable impossible crime stories from the 1950s and it was the decade in which Edward D. Hoch debuted – who did a Yeoman's job in keeping the form alive. So it wasn't a completely barren era, but I concede that the locked room yarn had seen better times. It made somewhat of a comeback during the 1970-and 80s (lots of entries in Adey's book for this period) with Pronzini and Resnicow being the most notable examples of contemporary mystery writers who began dabbling in locked rooms again. Excellent examples, TomCat! I have a paperback copy of the Gilbert book under its UK title, DEATH IN CAPTIVITY, and it has now been exhumed from its location in the TBR files and will be given new priority, thanks to you. I generally tend to think of Carr's books in a different realm, primarily because he was the first locked-room author I read and also my long-time favorite. The book by Hilary St. George Saunders is a very good one and it deserves to be better known. I have a vast collection of Ed Hoch's short stories which grew exponentially a few years back when old issues of Ellery Queen's Mystery Magazine were quite easy to come by. I do wish Crippen & Landru would publish more collections of his stories. As for David Alexander, I have been reading William L. DeAndrea's entries about his writings in 'Encyclopedia Mysteriosa'. Apparently he studied criminology before he started writing mysteries. I will keep an open eye for MURDER POINTS A FINGER.